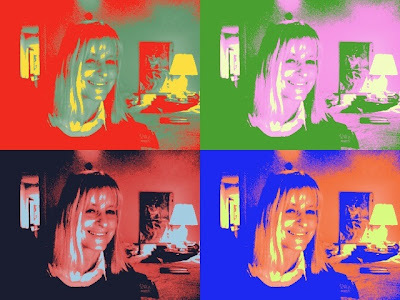 Eight self portrait-photos from my trusty Mac. getting up at 5:30 a.m.
and out. More tomorrow including real live painting! Get some sleep so you'll be ready for the excitement. Labels: photos a la Warhol. Wow! You are sensational! This very well could be a genuine Warhol. According to a recent article in the New York Review of Books, it has become increasingly difficult to authenticate Warhol's work. I would say this piece is worth a pretty penny. Btw thank you for all your help of late. Barbara you are lovely and fun! Do well, be successful and have a great time my friend! I don't know how you get up at 5:30 AM!! Goodness. That's practically the middle of the night. No I'm afraid A.W. would be quite upset with Macintosh. But I delight in their magic. You are sooooooo good, and so joyous, you make me very happy. You don't fool me. You are beautiful. 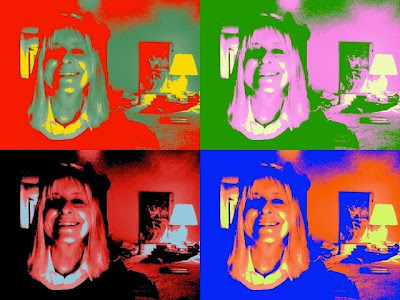 The Warhol colours obfuscate the deep purple circles. They could be green, or red, or orange. Yes this is a very late Warhol, kind of like those Gucci purses sold by street vendors. A NOT Warhol. Still some colour at the end of a long day is much appreciated. Uhh, I like these! If I were you I'd print this and hang it on the wall. You look beautiful! !